In the Leadership Sessions I train the Process Owners, Project Leads, and Facilitators; we preview what will happen in the next workshop and we prepare examples of the techniques (This is an action learning piece for them). The Facilitator will be running the team during the Workshop Sessions but the Project Lead and Process Owners have key roles as well, and so they need to know the BPM content as well as their role in the project. The Executive Sponsor comes for a portion of the meeting, so s/he sees the content tangibles and adds his/her perspective. In the first session for example, s/he adds comments on the charter improvement targets and vision, and suggests customers that would be good to talk with. In the second session the Executive Sponsor and Process Owner comment on the baseline metrics collected and identify success metrics. The Leadership sessions also prepare the Process Owner and Executive Sponsor for the meetings they will have between workshops with the Project Lead and Facilitator of their teams. We suggest these meetings be in between workshops and be 30-60 minutes. They are noted on the graphic with pink circle. I provide them a cheat sheet of questions they might ask, and suggest specific actions at each stage to support their teams. In the graphic above I have added the Team Meetings with orange arrows. The team meetings should take place each week between the workshops, so you will have 2-4 team meetings between each workshop. The team meetings include the Project Lead, internal Facilitator and team members. I suggest they be 90 minutes to 2 hours. One hour is just too short to get real work accomplished. In the team meetings the team completes the tasks that come out of the former workshop. For example, after Workshop 1 the team will complete other instances of their process diagrams, conduct the customer scorecard, and gather baseline data. I create a list of the assignments for the teams at the end of each workshop day, and they are provided as part of the content. Team meetings make sure the team does the needed work in a structured way. The Project Lead and internal Facilitator decide on the agenda for each team meeting and the facilitator runs this meeting. 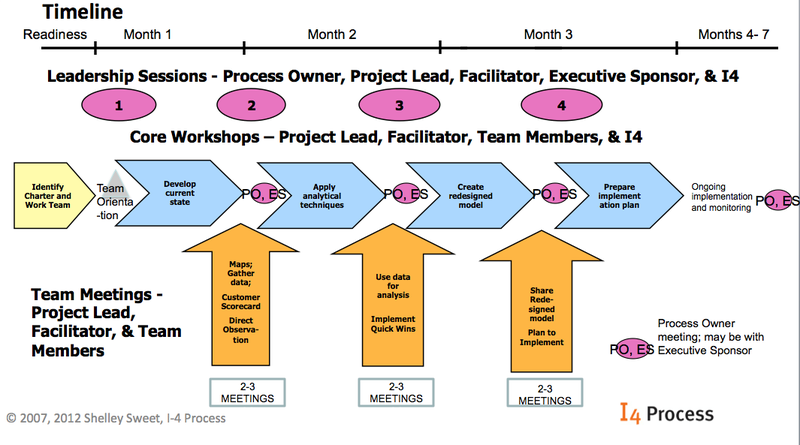 I do not recommend the Project Lead runs the meeting for two reasons: 1) the Project Lead is needed to provide input as a key subject matter expert; 2) the Project Lead may not be neutral and could push the team in one way or another. In addition the Project Lead is often the boss of people on the team and can tend to ‘silence’ the voice of others. Instead the Project Lead provides critical input for each team meeting and helps to keep the team on track for the Process Owner’s goals and the meeting goals. I do not attend these team meetings. I find it is critical to have the team engage among themselves and build their own capability. Teams really coalesce as a whole in these team meetings and begin to formulate their own ideas—another aspect of Action Learning. The team meetings really iterate the techniques learned in the workshop but enable employees to apply them and reflect in new ways. Employees are building their own professional capability here. Conclusion: Which BPM Training Method is Best? If you want employees to be introduced to some concepts and BPM techniques in a classroom or alone at the desk- Presentation and self-study are fine. If you want an employee to learn the method of a Master in the workplace, the Apprentice Method is useful. 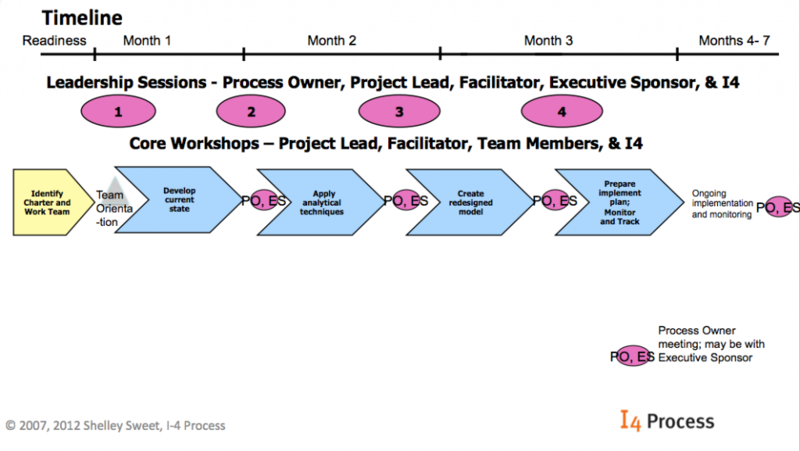 If you want to build the capability of your employees and leaders, and get them to become advocates for business process improvement, engage them in the process through leadership sessions, workshops, meetings with the Process Owner, and team meetings. If you want Sustainability you must begin by implementing, creating business results, and building capability. Want to learn more? Sign up for my live-online BPMessentials workshop, Starting and Organizing a BPM Project (June 18 and19, 2013) and Analyzing and Optimizing BPM Processes (July 30 and 31, 2013) Find out how to build high level maps with process owners and project leads, how to write a charter in 90 minutes, how to get the right members for a BPM team, how to document process models in the BPMN standard, using the free ITP software, how to use the 4 required techniques to analyze processes, and creative ways to build optimized processes.